mTransport increases students security thanks to a better communication between all school transportation stakeholders. The mTransport system makes life easier for everyone – administrators, parents, children and bus drivers – for standard or adapted school transportation. with impartial and precise data. frequent unexpected situations in school transportation. stay informed to act quickly when needed. that slips into in their daily habits. mTransport enhances the experience of all users involved in school logistics and transportation. Install a mobile device in your vehicles and get and overview in real time of trips and locations of your drivers and passengers. Access an overview of activities and history at all times. Retrace a student’s trip and make the most of data through our mobile solution, compatible with all existing systems. 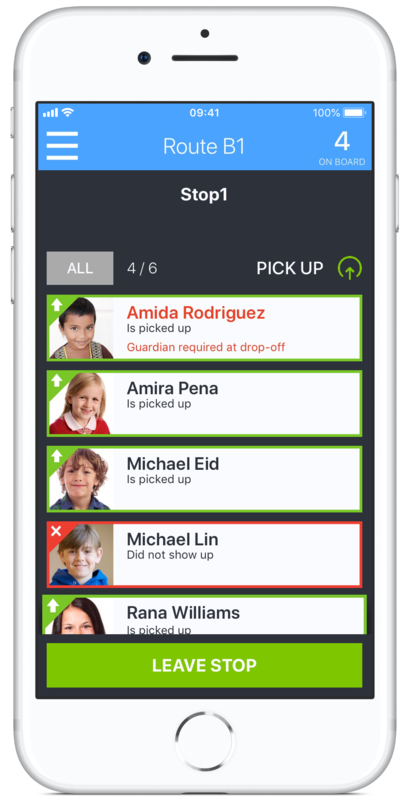 Get notified when the bus comes and receive a confirmation when your child gets in or off. Receive alerts if she misses the bus or gets off at a wrong stop. Enjoy a reliable et up-to-date information on your stops and your passengers. Access navigation aid, identify each student with her picture, get informed of changes and even of absences. Answer parents’ questions without delays. Simplify communication between all stakeholders and improve the effectiveness of interactions between services. With mTransport, each child receives a personalized welcome and enjoys a safe supervision. Discover our solution for a simpler, safer, and more efficient follow-up of school transportation. The Driver and Parent apps are available on iOS and Android. Contact us to find out how mTransport can revolutionize your school logistics.